The back side of Norway's currency will reflect the theme of "The Sea." Imagine if your $100 bill looked like a burning red sunrise over the North Atlantic. Norway wants to make that vision reality. 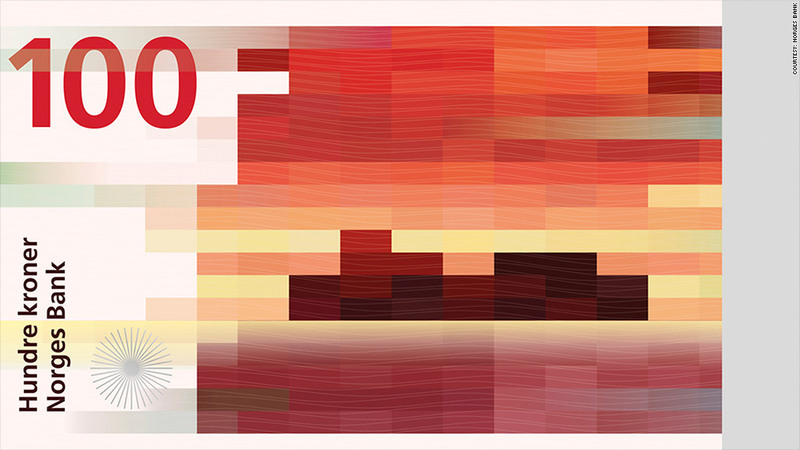 Norway unveiled new designs this week for its currency, the krone, that are filled with hues of red, orange and yellow. The visually-striking banknotes will debut in 2017 and certainly be contenders for world's best looking cash. The Norwegian government started an art competition in the spring to find the best design that fit the theme, "The Sea." The goal was to reflect Norway's past with modern flair. The new image honors the country's Viking era with a Nordic ship on the bill's front side and then a very modern series of color blocks on the back that are meant to mimic the country's landscapes. 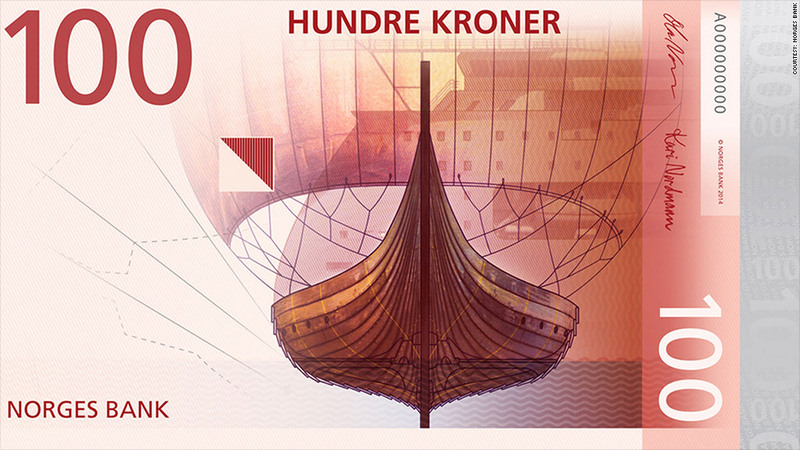 The front side of Norway's new 100 kroner bill. Although Finger's proposal won the art competition, two other proposals will be used for each side of the note. The front side is designed by Oslo-based graphic design studio The Metric System and the back side by international design firm Snøhetta. Snøhetta, which has offices in New York and Oslo, designed the new September 11 Museum Pavilion. The Norwegian government also commissioned it to design a graphic rendering for the country's bid for the 2022 Winter Olympic Games, which it eventually withdrew from. Related: Can rich countries afford the Olympics? Unlike many of its European neighbors, Norway did not switch to the euro in 1999. It kept the krone, and the newly designed bills are one more reason that was a good decision. Today, one US dollar is equal to about 6.50 kroner.